Steve Harvey Motivational Speech: JUMP! - Motivate Amaze Be GREAT: The Motivation and Inspiration for Self-Improvement you need! 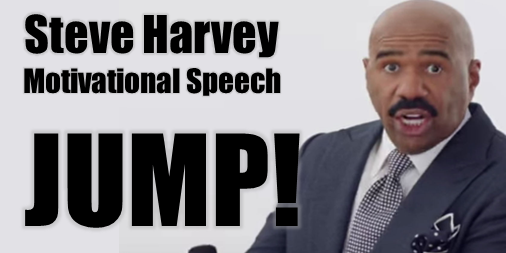 Home new Speeches Steve Harvey Motivational Speech: JUMP! Steve Harvey Motivational Speech: JUMP! Widely known as a tv host and comedian, Steve Harvey has a deeper and very spiritual side. He can be very motivational and inspirational when he's hosting shows like "Family Feud" or the "Steve Harvey" talk show to name a view. Besides his funny side that's always great to watch, Steve has blessed us with great motivational moments that inspire people to become better in life. One of those moments was a motivational speech at "Family Feud" show, where Steve took his time to address the public on how important it's to "jump" to become successful. Our purpose today is to analyze this speech and make you understand the importance of this mindset for you to reach your dreams. I’m going to share something with you. I’m going to tell you something... that every successful person has to do, including you. Believe it or not every successful person in this world has jumped. I’m going to tell you what I mean by that. You eventually are going to have to jump. You can not just exist in this life. You’ve got to try to life. If you are waking up thinking that it’s got to be more to your life than it is, man believe that it is. Believe in your heart of hearts that it is. But to get to that life you are going to have to jump. Our take: Success leaves clues, it's up to you to pick on them. Successful people did it somehow, find out that how. Steve Harvey gives us a shortcut to that, you have to "jump", you have to dare and have the courage to take risks. I tell you why I call it jumping. See God when he created all of use, gave every last one of use a gift at birth. He never created a soul without endowing it with a gift. You just gotta quit looking at gifts as running, jumping, singing, dancing. It’s more than that. It’s if you know how to network, you can connect dots, you draw, you teach, some of yall fry chicken better than anybody else, bake pie, some of you cut hair, color hair, some people do grass. Our take: Steve Harvey defines what "jumpin" means to him and this is very important, because some us think we aren't gifted, being successful it's just for other people. But if you look deep inside yourself you'll find out that you too have a gift! Find it and use it, take that jump to be what you're destined to be. Your gift can be anything, don't look for gifts that stars have, be your own star! I got a partner man never wanted to go out with us cause we stayed out to late. Come on man go out with use, nah I got to get up early in the morning and cut Mrs Johnson grass. We kept laughing at this dude. Cutting grass, how much does they pay you? He got a landscaping company in Cleveland worth 4 million dollars. Cause all he do is cut grass, but he was gifted at it. I got a partner own a detail shop make 800k dollars a year. Detailing cars he got six mobile trucks running around. 800k dollars a year all he do is detail cars. That’s his gift, that’s what he loves to do. You got to identify that gift. Our take: Great example about someone who found his gift and was committed to it. He got successful doing something most people would describe as ordinaire, but anything can become extraordinary if you work smart and work hard on it. Once again, find what that gift is and do the work, this partner of Steve was willing to sacrifice going out with his friends just to wake up early to cut grass, what are you willing to sacrifice for your gift? You have to make choices, prioritize your life. Now listen to me. When you see people in life. When you’re standing on the cliff of life and you see people soaring by, and you see people soaring going to exotic places. You hear about people doing wonderful things. Maybe you look up the street and your neighbor gets a car year and every two years. Yo... how is he doing that? Have you ever thought may this person right here has identified their gift and is living in their gift. Because your bible says, this is your bible, says your gift will make room for you. Your gift! Not your education. You go get an education. That’s nice but if you don’t use your gift that education is only going to take you so far. I know a lot of people that got degrees that they ain’t even using. It’s your gift. Our take: First Steve gives us a known sight, we all know people that's soaring in life and ask ourselves why? But he gives you the why on the second paragraph, those people live up to their gift. So, here's the importance of finding and using your gift. We've addressed this misconception people have about education before, education is great, but it's just a tool that can emphasize what you really are good at, that is your gift. The only way for you to soar is that you got to jump. You got to take that gift that’s packed away on your back and you got to jump off that cliff and pull that cord. That gift opens up and provides the soar. If you don’t ever use it , you are just gonna go to work. If you’re getting up going to work on a job everyday that you hate going to, that ain’t living man. You’re just existing. At one point in time you ought to see what living is like. But the only way to see what living is like, you’ve got to jump. Our take: You got to leave the "safety zone", you gotta have the courage to do so. You'll rely on your gift. Make room for it, work on it, and the gift will support you as well. The jumping metaphor and the backpack (parachute) are just great! Now, if you don't use your gift things will not change, the other side of the coin is a boring and dreadful life. Here is the problem, I’m going to just be real with you, when you first jump. Let me tell you something, your parachute will not open right away. I’m sorry. I wish I could tell you it did but it don’t. When you jump it’s not going to open right away. You are going to hit them rocks. You are going to get some skin torn off on them cliffs. You're going to get all your clothes torn off. You’re going to get some cuts on you and your going to be bleeding pretty bad but eventually, eventually, the parachute has to open. That is a promise of God. That ain’t a theory, that’s a promise. His promises are true just listen to me. You can not name one single thing God has not gotten you through. Name it! And if he ain’t got you through it, he is currently pulling you through it right now. The living proof of it is your sitting in here. If he hadn’t got you through it you wouldn’t even be here. So if he ain’t never not got you through it, why would he not let your parachute open? It has to open man. But you got to jump though. Our take: This is the number one reason why people hesitate to jump, because there is nothing there to see at first glance. It's a leap of faith, you have to believe in your gift, you got to have a vision that's better than your current reality. You can change your current situation only by imagining a better one, but only if you take a leap of faith into that scenario somewhere in time. Now here is another thing. You can play it safe and deal without the cuts and the tears. You can stand on that cliff of life forever safe. If you don’t jump I got another promise I can make you. Your parachute will never open. You will never know. You will never know what God really has for you. See your God has a wonderful life for you. Once again I’m going to refer to your bible. You go down there and memorize these scriptures and don’t apply them to yourself. Your bible says that he comes to give you life and give you life more abundantly. If I were you I would jump. Because that’s the only way to get to that abundant life. You got to jump man. You got to take a chance. Now when I get through talking, there are those of you who will discuss this in the car. Well I got bills and I got bills. Whether you stay on the cliff or you jump you’re going to have bills. Well if I quit my job I’m going to ruin my credit. If you got a job you living check to check, even if you got A1 credit you can’t buy noting else no damn way. Our take: Here's the catch, if you don't jump you'll never know what you might have been in this life, you'll live forever in "what if..." land. Take that chance, risk it, because that's the only way you'll know if it works, but more! If it doesn't work, you can learn from that experience and adjust how you're going to approach things the next time around and give it one more shot. You don't fail, you learn with each experience, and eventually one day you'll succeed. The third paragraph is really deep, because we all think like this when it's time to make a change. Of course there are bills to pay, but what do you prefer? To be forever stuck on a job that you hate just to pay the bills and nothing else, or to have the possibility to one day be financially free despite a rough start? At one point and time man do yourself a favor, go see what God really do. God holds you up man he ain’t gonna let you fall. He didn’t bring you this far to let you fall. Do yourself a favor man before you leave this world. Before you die, Jump. Just jump one time. Just Jump. Thank you very much. Our take: Steve once again gets spiritual and you should too whatever your religion is, or even if you don't have one, it's crucial to accept that there is a spiritual side to this. Because having faith, believing in things you don't see, taking that jump, that leap of faith, those are all fundamental steps to be successful. So, once again make that jump! Follow your gifts!